Yesterday, I took the time to slow down and go to a yoga class. I do my own practice at home but there is nothing like going to an hour and a half class that is structured and well taught. Since increasing my running over the past year or so, I find that certain parts of my body are stronger (which is GREAT for running) but also much less flexible (which can lead to feeling achy, getting injured, etc). As much as I love running, taking burn classes, and packing my day full, sometimes I realize that my body is craving yoga. Yoga is much more than a “workout”, so I never call it that. I consider it a time to consciously breathe, stretch, release tension, and let go! Before I go on and on, I thought I would share a little background about my first love. 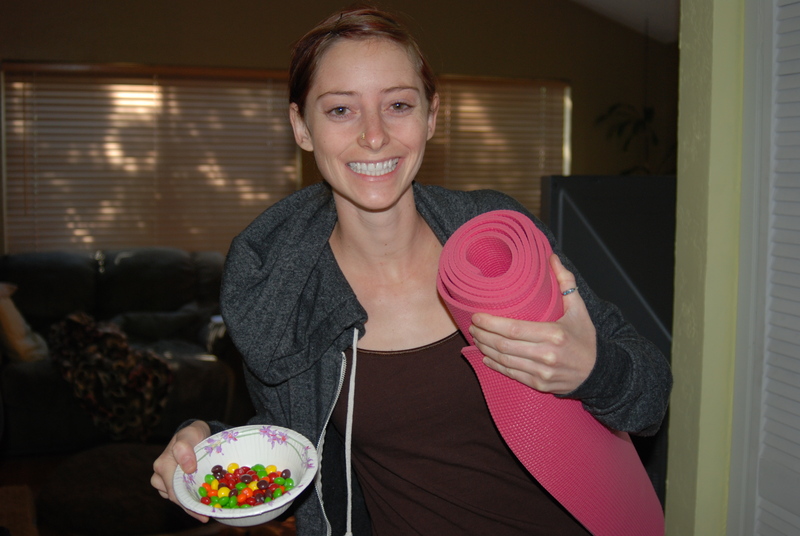 I took my first yoga class at age 13 or 14. My mom convinced me to go with her and I was a typical unhappy/annoyed teenager, whining the whole way there and back. The class was made up of mostly seniors, making my mom and I the youngest by far. The teacher was an incredible woman who I grew more fond of each time I went. 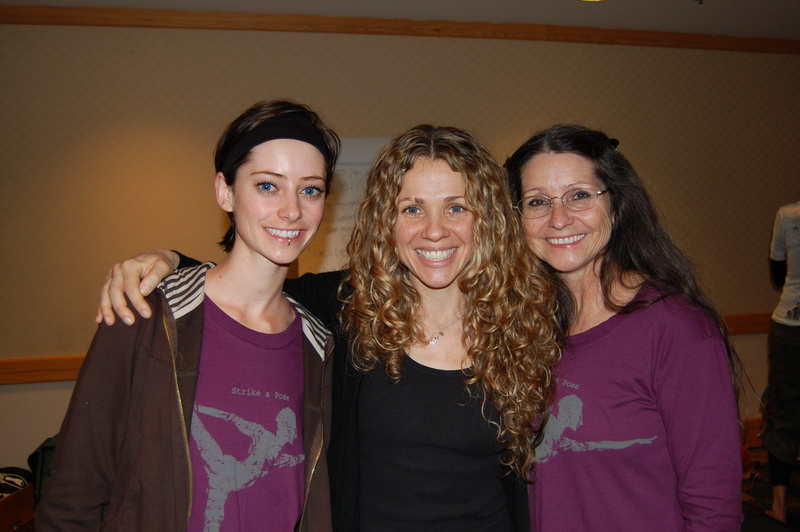 Her own story of finding yoga was moving, so moving, that my teenage self was even moved. Long story short, I became the token teen in my mom’s senior/middle-aged yoga class and no longer went to class just because my mom dragged me. I wanted to go. I started to see positive changes in my life, way beyond the obvious physical changes that occur with any type of body movement. I started to feel less anxious (something I struggled with immensely during my teen days). I started to realize how much tension I held in my shoulders and face. And, I started to breathe. 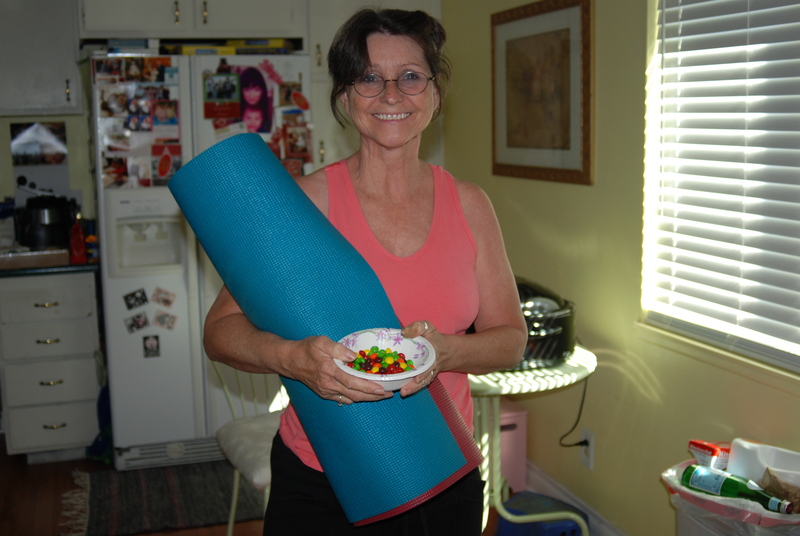 My mom became a yoga teacher after a few years of practicing and of course, I went to all of her classes. The love blossomed. I had an outlet for anxiety and a place to slowly build my confidence. Yoga for me, has always been a place where I can worry less about being perfect and give myself space to just be me. The other amazing thing about yoga is that it made my mom and I extremely close. No matter how many races I run, weights I lift, or things I juggle, I know that yoga is always there for me. I am so grateful that my mom had the foresight to drag me along to her yoga class, despite my attitude. 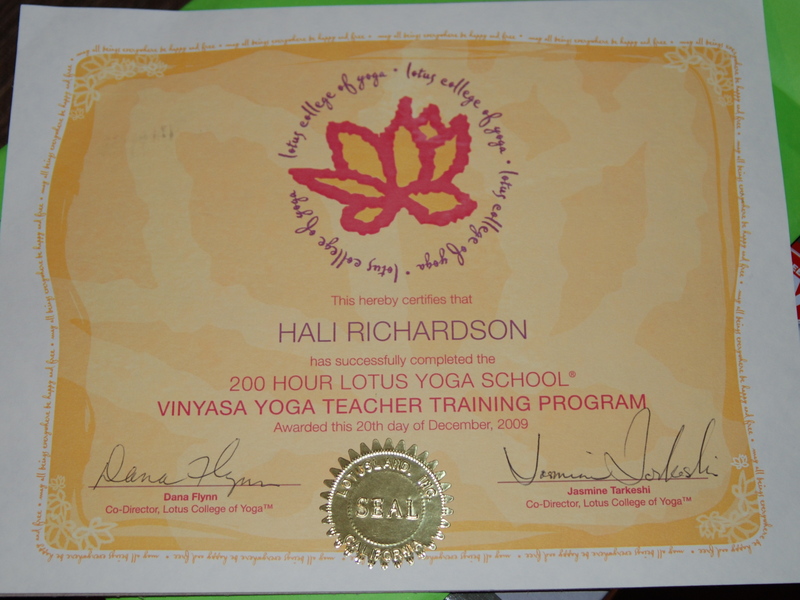 I became a registered yoga teacher in 2009 at Laughing Lotus Yoga Center in San Francisco, one of the most beautiful and incredible studios I have ever been to. I was very fortunate to learn from two incredible teachers (Jasmine Tarkeshi & Keith Borden) and a wonderful mentor (Katherine Otis). My class was also full of inspiring and supportive people. I think it is safe to say that my first love is a forever kind of love. And, I think that is something I am totally okay with! 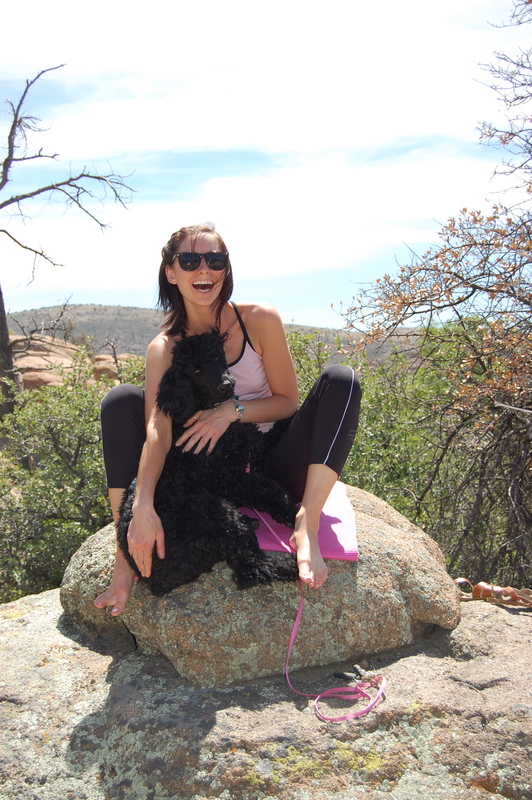 Doing yoga with my mom’s poodle, nothing better! Yoga has given me so much I can’t even put into words, but the closeness with you, Hali, is the best of all. 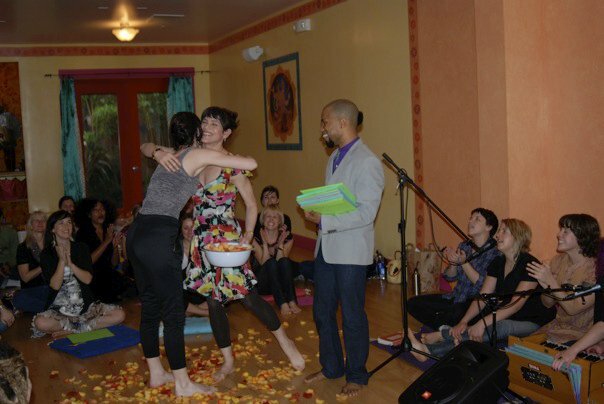 I have enjoyed our yoga classes, conferences, and the memories we’ve made. (Like finding a yoga studio in Paris that you got to by walking through a restaurant!). I hope we get to do yoga together for many, many years, and hopefully in lots of different countries! Namaste! PS.. Ayosea’s birthday was May 21. she’s 80…something! Each time I talk to her she asks me how you are doing! You are very special to her. Awe mama! I can’t wait to have many more yoga and life adventures with you. I will NEVER forget that yoga class in Paris!! How funny that the entrance was through that restaurant!!! Remember how hot we were by the time we found the class!? 🙂 Wow, can’t believe Ayosea is 80. I love her! What a great post! I love seeing you in your yoga posesl You’re fantastic! My favorite pose is pincha mayurasana, or elbow stand. My least favorite is ardha shandrasana (spelling?) It’s as hard to spell as it is to perform. Thanks Taya! I LOVE pincha mayurasana too (this reminds me of when we would do yoga poses and chat during work :-). I also love pigeon pose! I love pigeon too and I’d forgotten doing yoga at work. It was the perfect space, long and narrow. I did pilates with Andrew and yoga with you. We were an athletic staff. And to think, you were coming back! Glad it’s not all about running for you, because my running days are over. Yes, we were an athletic and super rad group. I will miss our Sunday talks and laughs soooo much. Yep, I try to balance out the running as much as possible so my body can stay healthy and I can be a rockstar like you doing spin/pilates/yoga and showing up the young kids! !